La Pastorela, Let the Eagle Fly, and I Am Celso, among others, are Teatro Máscara Mágica productions that have garnered critical success and embedded their creative imprint on the cultural map of the city. La Jolla Playhouse (LJP) has proudly announced Teatro Máscara Mágica (TMM) as its 2013/2014 resident theater company. TMM is now part of a growing family of outstanding local theater troupes in LJP’s annual residency. Former appointees include Mo’olelo Performing Arts Company, Moxie Theatre, San Diego Asian American Repertory Theatre and Eveoke Dance Theatre. López’s play confronts Arizona’s anti-immigration issues and the creation of violence against Latinos due, in large part, to the inflammatory behavior of extremist media. Lopez is a San Diego-bred, award-winning playwright. Her best-known works are “Simply Maria” and “Real Women Have Curves.” The latter became a film and earned the Humanitas Prize and a slot at the Sundance Film Festival. Virchis has produced and directed several of Lopez’s works. “(TMM’s) mission is in concert with the La Jolla Playhouse in that it provides opportunities for creative, innovative, cutting-edge and thought-provoking theater,” Virchis said. Playhouse Artistic Director Christopher Ashley agreed. “(TMM’s) passion and dedication to shining a light on diverse cultures and voices have made them a fixture in San Diego’s cultural community for 25 years, and an ideal choice for our Resident Theatre Program,” he said in a statement. Virchis believes that both organizations consider theater as a place where artists convey the truth of the human condition. Performers commit to telling stories that engage all of us to think, laugh, cry and hopefully bring about change for the better, he said. TMM was the first “common ground” theater in San Diego, founded in 1989, according to Virchis. Generations of patrons have come to TMM’s plays and have followed the troupe faithfully, “from the Old Globe Theatre where it all began, to the San Diego Repertory Theatre, to other local venues and now to the jewel on the hill, the La Jolla Playhouse,” Virchis said. As a common ground theater, TMM’s culturally diverse team of artists and supporters believe that “all races, creeds and cultures in the United States should have opportunities for artistic expression,” Virchis explained. In December, TMM is planning the 25th Anniversary of its holiday tradition “La Pasto-rela,” written by Max Branscomb at the San Diego Repertory Theatre Company. “La Pastorela” is an award-winning, bilingual family tradition heralded as one of the South-west’s best holiday productions by audiences and theater critics. One of TMM’s objectives is to make tickets affordable to a broader theater-going public, providing accessibility to under-served communities. Prices for “Detained in the Desert” are $25 general admission, $15 for students and military and $10 for seniors and groups of 10 or more. According to Ashley, all ticket proceeds go to the company in residence to support their programming and future endeavors. The relationship between TMM and LJP is a win-win situation. “It’s like moving into a mansion, and you are living and working in one room for one year,” Virchis said. “The impact of the residency can be tremendous for both theater companies. TMM needs to drive people to the jewel. We want them to come visit the room and stay with us for the residency and beyond,” he said. “It has been very important to us that we open the doors to a broad and diverse audience,” he said. Choosing TMM also confirms, in part, the Playhouse’s connection to higher education in San Diego. 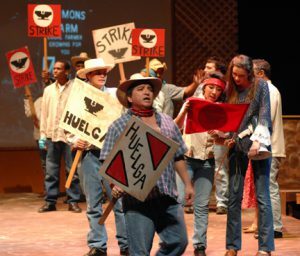 The two founding fathers, Virchis and Jorge Huerta, Ph.D., have both been award-winning dramaturge/professors, Virchis at Southwestern College and Huerta at UCSD. 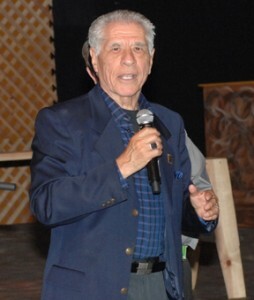 Founder and Artistic Director of Teatro Máscara Mágica, William Virchis. TMM is also committed to education, developing new talent and introducing multi-cultural theater to students from kinder through university with a focus on supporting disadvantaged youth. Virchis plans to continue TMM’s educational touring company, an educational outreach program that enhances the theatrical arts in local schools, he said. “Art in the education system is an inherent part of what TMM looks to offer to the youth of our community,” Virchis said. TMM’s professional actors donate their time to mentor students and act beside them in their own renditions of culturally rich productions, he added. The experience exposes students to the key players in theater: actors, playwrights, directors and stage technicians. “Detained in the Desert” will run from Aug. 28 through Sept. 15. TMM will present another production in May-June. “As a possibility, we are working on an original musical that is about the relationship of Pancho Villa and Emilio Zapata and the Mexican Revolution,” Virchis said. TMM is also exploring a revival of “Selena Forever,” the musical about the famous singer-songwriter Selena, Virchis said. Another option is a Latino version of the “Odd Couple,” starring Paul Rodriguez. “Whatever we produce will be in concert with our mission and the mission of the La Jolla Playhouse Residency Program,” Virchis said.